Granules of aluminium (grey) become a metallic foam when heated.The tompgraphies document the evolution of pores with time. 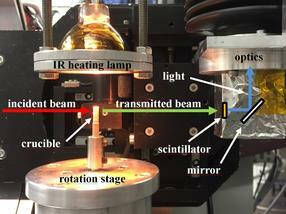 Experimental setup is composed of a fast-rotation stage, an IR heating lamp (temperature up to 800 °C), a BN crucible transparent to X-rays, a 200-μm thick LuAG:Ce scintillator, a white-beam optical system, and a PCO Dimax CMOS camera. The incident (red) and transmitted (green) X-ray beams as well as the light path from the scintillator to the camera (blue) are shown. An HZB team has developed an ingenious precision rotary table at the EDDI beamline at BESSY II and combined it with particularly fast optics. This enabled them to document the formation of pores in grains of metal during foaming processes at 25 tomographic images per second - a world record. The quality of materials often depends on the manufacturing process. In casting and welding, for example, the rate at which melts solidify and the resulting microstructure of the alloy is important. With metallic foams as well, it depends on exactly how the foaming process takes place. To understand these processes fully requires fast sensing capability. The fastest 3D tomographic images to date have now been achieved at the BESSY II X-ray source operated by the Helmholtz-Zentrum Berlin. Dr. Francisco Garcia-Moreno and his team have designed a turntable that rotates ultra-stably about its axis at a constant rotational speed. This really depends on the highest precision: Any tumbling around the rotation axis or even minimal deviations in the rotation speed would prevent the reliable calculation of the 3D tomography. While commercially available solutions costing several hundred thousand euros allow up to 20 tomographic images per second, the Berlin physicists were able to develop a significantly cheaper solution that is even faster. ”My two doctoral students at the Technische Universität Berlin produced the specimen holders themselves on the lathe”, says Garcia-Moreno, who not only enjoys working out solutions to tricky technical problems, but possesses a lot of craftsman skill himself as well. Additional components were produced in the HZB workshop. In addition, Garcia-Moreno and his colleague Dr. Catalina Jimenez had already developed specialized optics for the fast CMOS camera during the preliminary stages of this work that allows even for simultaneous diffraction. This makes it possible to record approximately 2000 projections per second, from which a total of 25 three-dimensional tomographic images can be created. As a first example, the team investigated granules of aluminium alloys that become a metallic foam when heated. To do this, they mounted a powerful infrared lamp above the metal granulate to heat the sample to about 650 degrees Celsius. A complete 3D tomographic image with spatial resolution of 2,5 micrometers (pixel size) was generated every 40 milliseconds. 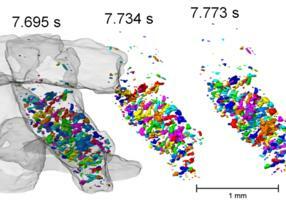 The nearly 400 tomographic 3D images now allow detailed, time-resolved analysis of the process as it occurred,. "We wanted to develop a better understanding of how pores form in the grains – whether they also reach the granule surfaces and to what extent this process varies in different granules”, explains Garcia-Moreno. It is a question of practical relevance that is also of interest to industry. This is because granules of metallic compounds might fill complicated shapes better while foaming than foams manufactured from a block of metal. However, the moulded part will only be able to withstand stress if the grains also bond closely with one another during foaming. With the ultra-fast 3D tomography developed at BESSY II, this can now be observed very precisely – as well as a multitude of other dynamic processes. 2Are Drones Coming to Life Science Labs? analytica-world.com is the industry portal of the international trade fair analytica, which is organized by Messe München. It features useful information about markets, trends and innovations. It is operated by LUMITOS AG, one of analytica's official sales partners. Our advertising formats support you in getting your message across to a clearly defined target audience.